In Japanese Candlestick Charting Techniques , Steve Nison included a section on using candlesticks with oscillators including stochastics, RSI, and moving average oscillator. According to Steve Nison, oscillators are objective and augment the more subjective candlestick patterns. 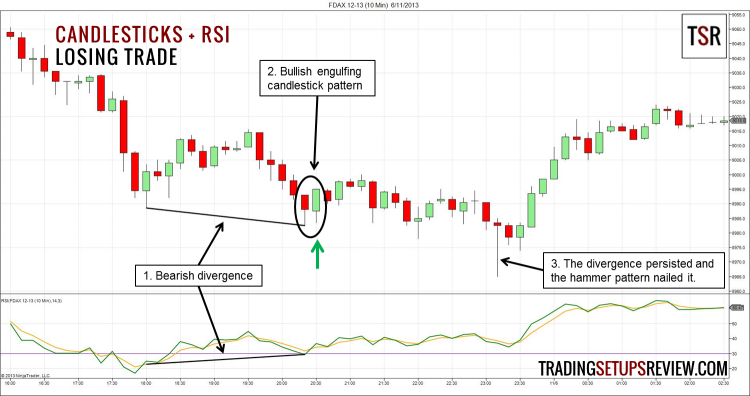 In our review, we will focus on using candlestick patterns with Welles Wilder’s RSI. RSI measures the momentum of gains and losses. The relative strength in the formula refers to the ratio of average gain to average loss. These averages are calculated in a way similar to the exponential moving average, before turning the relative strength into an index that fluctuates between 0 and 100. 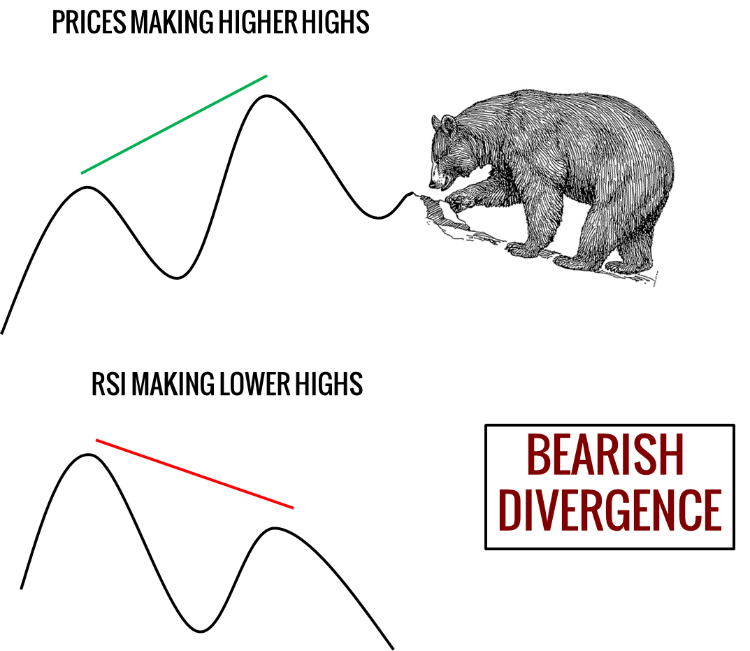 Other than candlestick patterns, we will also look out for RSI divergences in our trade setups. Divergences occur when RSI does not support prices. The diagram below illustrates a bearish RSI divergence. This daily chart of IBM shows two consecutive bearish divergences (also called a three-point divergence). With a clear evening star candlestick pattern, we shorted at the red arrow for a quick and profitable trade. As prices pushed higher, RSI made a lower high which completed the first bearish divergence. However, no candlestick reversal pattern was present, so we sat on our hands. Prices made another high after some sideways movement. However, RSI did not make a higher high, and we got another bearish divergence. Although IBM tested a new high, it was not able to close above the previous swing high. This failure was a bearish sign. The next day completed the evening star candlestick pattern, and we shorted. The earlier gap (or window in candlestick-speak) was the perfect price target. This is a 10-minute chart of the futures on the DAX, Germany’s blue-chip stock index. It is very liquid and suited for active trading. Let’s take a closer look at this failed trade setup. Prices made a lower low not supported by the RSI; a bullish divergence. However, after our losing trade, the bullish divergence continued. Finally, the hammer candlestick pattern nailed a profitable long trade. 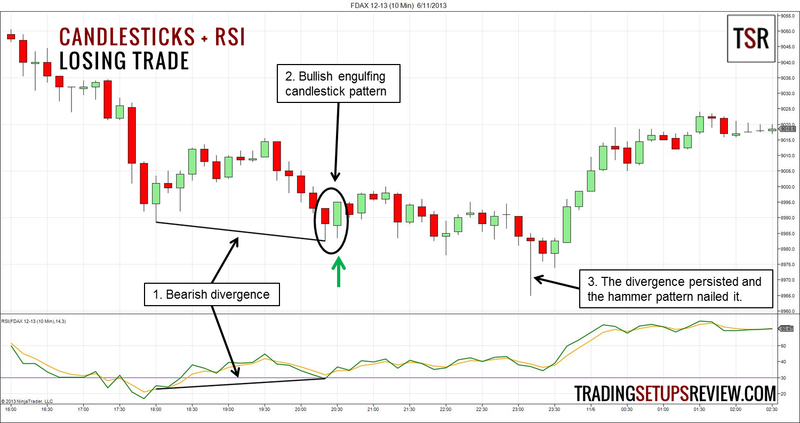 In a nutshell, this trading strategy of combining candlestick patterns and RSI divergence is a reversal trade setup. Reversal trade setups have a low chance of success and a high reward-to-risk ratio. 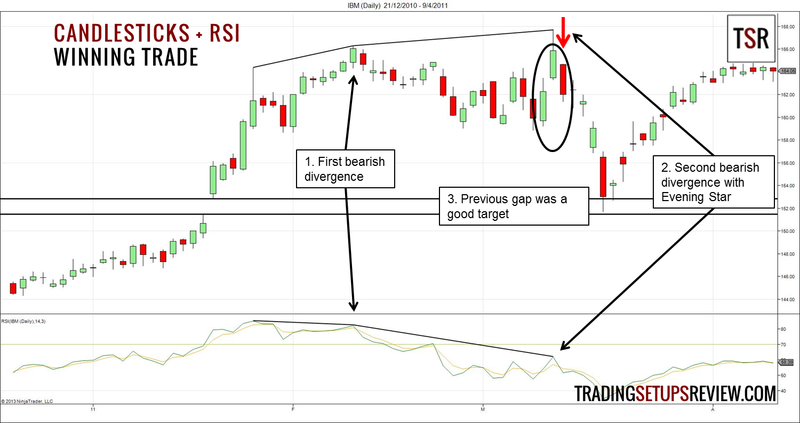 Using RSI divergences to find exhausted trends helps to improve the odds of a reversal trade. However, the problem with divergences is that they merely hint at an impending reversal. The hints might keep coming, and coming, and coming before the reversal actually takes place. While looking out for candlestick patterns help to pinpoint better entries, whipsaws are inevitable and consecutive losses might take place. Hence, we must be nimble and try to scratch losing trades. Pay attention to price action after entry. The best reversals happen swiftly, and you should see strong bars in your trade direction within two to three bars of your entry. If not, exit with a small loss or profit and wait for better opportunities. Divergences are uncommon. To find trading opportunities efficiently, you can use a stock scanner to scan for RSI divergence in a basket of stocks, before looking a closer look to see if there is a trade setup. For learning more about candlestick patterns and how to combine them other oscillators like stochastics, you should refer to Steve Nison’s book, Japanese Candlestick Charting Techniques. This book is a superb reference text that is part of in the Chartered Market Technician program. 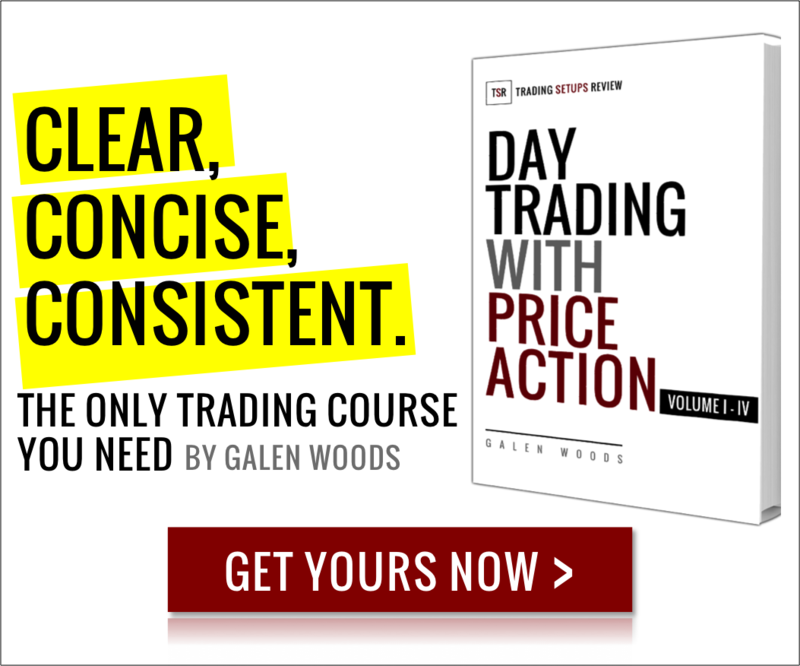 For other candlestick pattern trade setups featured previously on Trading Setups Review, you can look at the Sakata method, and using moving averages with candlestick patterns.